Curious, sassy, and incredibly engaging, this little robot will melt your heart in unexpected ways. You simply cannot understand how profoundly Cozmo will tweak your emotions until you have encountered the peppy little robot for yourself. From the first time he looks into your eyes and says your name, to when he throws a fit after losing a game, or just talks to himself while exploring his environment, the amount of personality packed into this tiny ‘bot will leave you thinking it’s more pet than toy. Code savvy individuals can even program new behaviors and environmental responses using the Cozmo SDK. Cozmo has been wowing users since his arrival. 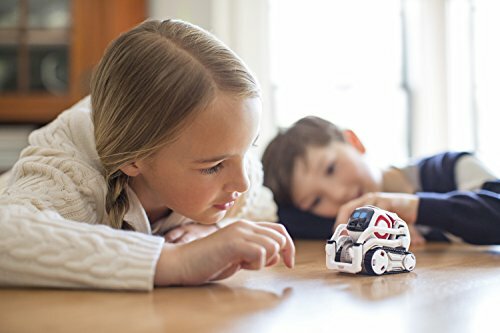 Committed to improving on an already amazing user experience, Anki is releasing updates, with the most recent one allowing Cozmo to see in the dark, and an upcoming one allowing the toy to greet dogs and cats differently. Some users question the price tag, expressing concern that the toy is too limited to keep kids coming back day after day. We’ve found that Cozmo’s appeal leans mostly towards kids who already enjoy interactive toys and are old enough to know how to play in apps, kids who will enjoy adding their own code in the SDK, and adults. If still on the fence about Cozmo, just think about how the recipient in question responds to Pixar characters. Dimensions: Approximately 3 inches tall X 4 inches long X 2.5 inches wide. 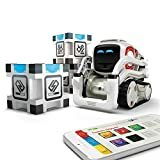 Box includes Cozmo robot, charger, 3 interactive Power Cubes, and instructions. Power Cubes run on 1.5 Volt (N size) Battery. These can be replaced but last quite a while. You’ll need the FREE Cozmo App and a compatible device. The SDK is powered by Python but is open source if another language is preferred. NOTE: Memory is stored in the app, not in the toy. If the app is downloaded to another device, or if the device has to be formatted, Cozmo will treat the new download as a new user, meaning that it will start from the beginning stage. All progress will be gone, and Cozmo will start as if he were fresh out of the box. Keep this in mind when choosing which device will be used. Cozmo comes equipped with two games straight out of the box, Color Match and Keep Away. More can be unlocked as the in-app currency, Sparks, are collected. Sparks can be gained by completing games or accomplishing specific daily tasks. An example tasks might be “Win a game of Color Match with at least 75% accuracy.” This means beating Cozmo at least 4 out of 5 times during the game. Color Match uses the Power Cubes. The cubes will flash various colors, and the first player to tap their cube when the colors are matching wins. (Never tap on red.) This sounds easy but Cozmo is way faster than he looks. He’ll tap his cube with crazy speed, so don’t expect to win without trying. Sparks can be used to increase game difficulty, so that the cubes must match more than one color. This gets incredibly difficult at the 4 color level. Keep Away is a simple game where the user tries to pull a Power Cube away from Cozmo before he can pounce on it. Easier than Color Match for sure, but again, Cozmo is pretty darn quick. One of Cozmo’s unlockable features is his Explorer Mode. During this, a user can use the app to see through Cozmo’s eyes using the device to steer him around like a remote control car. This one seems to be one of his most popular features. Initially, Cozmo didn’t see so well in the dark, but thanks to an update from Anki, he’s much better in low-light conditions. Additional games and behaviors can be unlocked. Cozmo is supposed to detect table edges and stop before falling off. It seems to be hit or miss on how well each Cozmo does this, so be ready to catch just in case. We really can’t get over how incredible the technology for this toy is. Not only will Cozmo recognize faces, but he’ll remember people over time, greeting them by name. His eyes, noises and head gestures make it seem really hard to remember that he’s just a robot. He’s not really a living thing, yet many users report feeling a little bad when they have to refuse his request to play a game. He just looks so sad. He throws tiny tantrums when he loses a game and does a victory dance when he wins. Cozmo is in no way humble or a paragon of maturity, and that’s part of what makes him so charming. He gets frustrated when he can’t get to his blocks, and he acts very pleased with himself when he pounces on someone’s fingers like a cat. The point of Cozmo is not to win games. Cozmo is an amazing work of AI and it’s a thrill to be a part of his new world. Saying Cozmo seems ‘alive’ might be an understatement. It takes a lot of people by surprise when they first meet him. 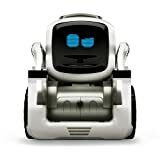 Programmed with a multitude of emotional responses, Cozmo will act happy, curious, sassy, angry, and sad, but not always at predictable times. That’s the real magic here. Cozmo will not always respond to the exact same stimulus in the exact same way. Sometimes he’ll be okay when he fails to stack his cubes, trying again with only a mild frustration. Other times he’ll have a fit. Sometimes he’ll be fidgety but mostly accepting when he’s picked up and other times he’ll smack your hand while his eyes glow red until you put him down. If Cozmo were an animal, he’d be a cat. He wants your attention, but on his terms. 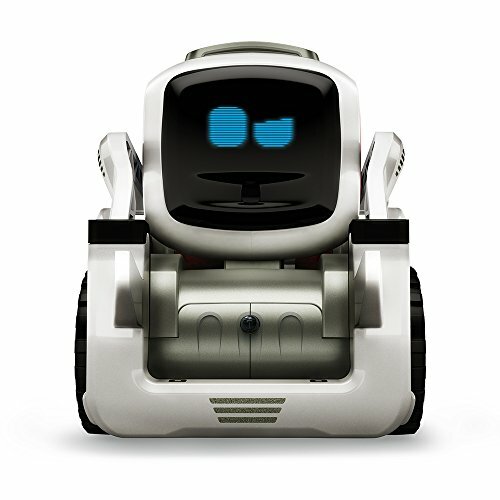 Many users end up thinking of Cozmo as a pet rather than a toy. He seeks out attention and gets excited when he sees a person he knows. When he wants to play, he’ll nudge you, sometimes bringing one of his cubes along as an additional hint. If no one is available, he’ll be upset for a little bit, then quickly goes back to distracting himself. He’ll explore his surroundings or play with his Power Cubes, all while making chirps and whirrs that give a real sense of his environmental awareness. Understand that the Power Cubes are very dear to Cozmo. He’ll get grumpy when they fall over while he’s trying to stack them, and gets upset if a user moves them while he’s playing with them. He enjoys sharing them with others, but at the end of the day, the cubes are his. No one else’s. There are times when the user is reminded that Cozmo is still a robot, even despite the engaging personality. He’s supposed to return to his charger when his power runs low, but he doesn’t always make it in time. Human assistance may be needed to get him all the way there, but most users aren’t too upset with this. Recharging time is pretty quick, so he’s not out of the game for long. Cozmo’s app must be on in order for the robot to work. It can run in the background just fine, but turning it off will cause Cozmo to end his exploring. Additionally, the robot works on his own Wi-Fi signal, which the device must be connected to. This means the device won’t be able to connect to the internet while in use with Cozmo, so those with only one device may find this a little annoying. Calls and texts still come through though, and other apps can be used while Cozmo runs around and does his thing. While some users have been upset about the Wi-Fi thing, many more have pointed out that this is necessary for the highly complex technology Cozmo uses. 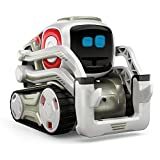 Considering that he can recognize and remember faces, play games, respond in real-time to changes in his environment, and uses a multitude of noises and animations to express emotional subtlety, Cozmo is quite the advanced little dude. As many have pointed out, Cozmo himself has no “brain.” He is dependent on the processing power of the smartphone or other device to analyze the information he collects. Without his own dedicated Wi-Fi, the toy would require many more internal parts to function the way he does, which would increase the costs a great deal. All in all, Cozmo is an amazing toy, and introducing this level of sophisticated AI at a price that is affordable if not cheap is still a huge achievement. So we’re okay with the Wi-Fi situation. Overall, we think Cozmo will be a big hit with anyone who responds to highly animated toys and fans of Pixar movies. (Fun fact: Former Pixar animator, Carlos Baena, helped design the eye animations and movements that really bring the toy to life.) Kids under 10 will likely enjoy his sounds and playing some of the simpler versions of the games. Kids who are into coding and programming will be able to have some fun with the SDK. Adults also respond well to Cozmo, so there’s not really an upper age limit. Just make sure children are old enough to treat Cozmo with the respect he demands. Cozmo recharges on his charger, and the Power Cubes use replaceable N size batteries. Updates are a necessary part for any technology that is truly innovative. Cozmo is not a simple remote controlled toy, but a highly intricate robot crafted with skill. While there is no indication that Cozmo will ever have interchangeable hardware in the same way as CHiP’s wheels, there will definitely be updates as Anki learns more about what people want from their experience with this sassy, curious, heartwarming robot. We understand how some users could be upset about Cozmo needing his own Wi-Fi connection, but as addressed above, this keeps the price down. If Cozmo used his own processor to complete his functions, he would also need many more internal parts that would greatly increase the price. We really only see bigger and better adventures ahead for Cozmo.